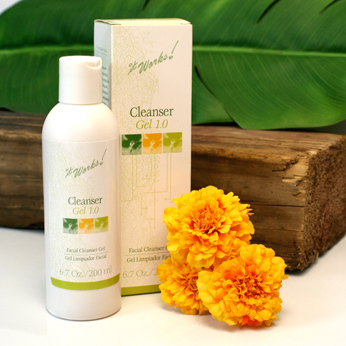 Rinse away the daily grime with the It Works Cleanser Gel using beautifying botanicals! Gently sweeps away all skin dulling elements, including oil, dirt, pollutants, and even the toughest of makeup, without stripping skin of its natural moisture. Ideal for shaving. This silky, clean-rinsing lather is sure to become a favorite in your daily beauty routine. Leaves skin both squeaky clean and silky smooth. Loyal Customer Price: $28.00 Find out more about how you can Become a Loyal Customer and get this pricing! Tip: Because it rinses clean with no soapy residue, Cleanser Gel is ideal for removing impurities from the skin before using one of our best-selling body contouring Applicators.Directions: Wet hands and face with warm water. Apply a small amount of Cleanser Gel on hands. Work into a rich, foamy lather and massage lather onto face and neck with a gentle circular motion. Rinse with warm water and pat dry. For best results, follow with the It Works! Hydrating Toner and one of our rejuvenating moisturizers: PreventAge and RepairAge.